A simple hand-lettered sign on a boutique. When will they return? Who knows! Rome is deserted. For the past three weeks, the city has become progressively quieter: less traffic, fewer stores open. Some of the city buses are on a special schedule in August with reduced runs. Even the seagulls that frequent our neighborhood and scream at 3:00AM seem to have taken off for parts unknown. There are fewer dogs in the park, and fewer runners, too. Some mornings I can walk through Villa Borghese and see almost no one except the omnipresent vendors setting up for the day’s business. 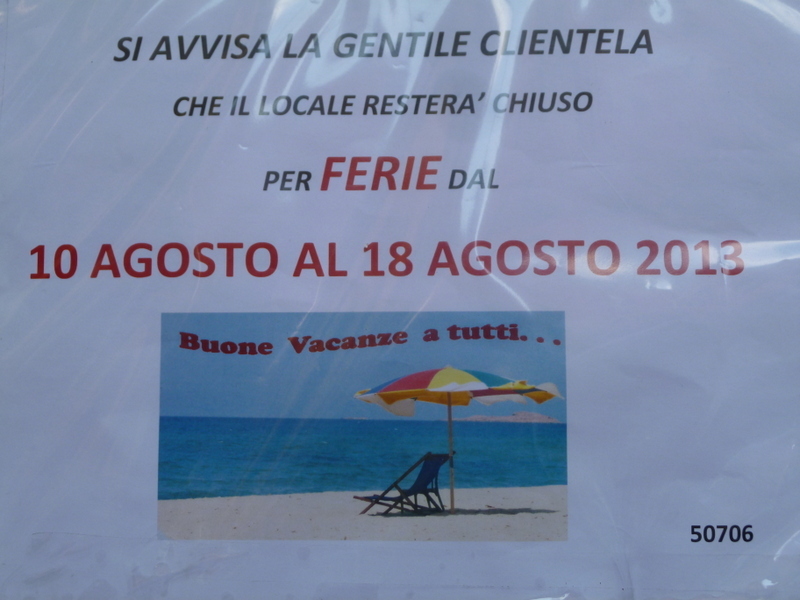 I cannot possibly imagine this happening in the United States, but store after store is closed per ferie, the period surrounding the mid-August holiday of ferragosto. I won’t go into the ancient roots of this holiday, or the fact that it was co-opted by “The Church.” I will tell you what it is like this month. People are at the beach, whether for the day, the week or the month. Those that are not at the beach are in the mountains, but most Italians are true sun-worshipers and so they flock to the beach where they lay on a chaise lounge under an umbrella, side-by-side-by-side. Businesses are shuttered with little signs that say how long they will be chiuso. Could be a week, or even the entire month. You can find a place to park on almost any street, in almost any piazza. This does not happen any other time of the year. Buses run almost empty. A more formal sign assures customers of this cafe that they will only be closed a week. Everyone to the beach! Restaurants are closed or quasi-empty. Two weeks ago, on a Saturday night, we went to a highly recommended restaurant near the Embassy and at the peak dining hour of 21:00 we were the only customers! I’d even made a reservation. A very uncomfortable situation for us and for the restaurant owner. Luckily the quality of the food did not suffer. An Italian friend told me that when she was a child (35-40 years ago) it was even quieter in August. It was even difficult to get groceries as supermarkets and shopping centers did not exist. 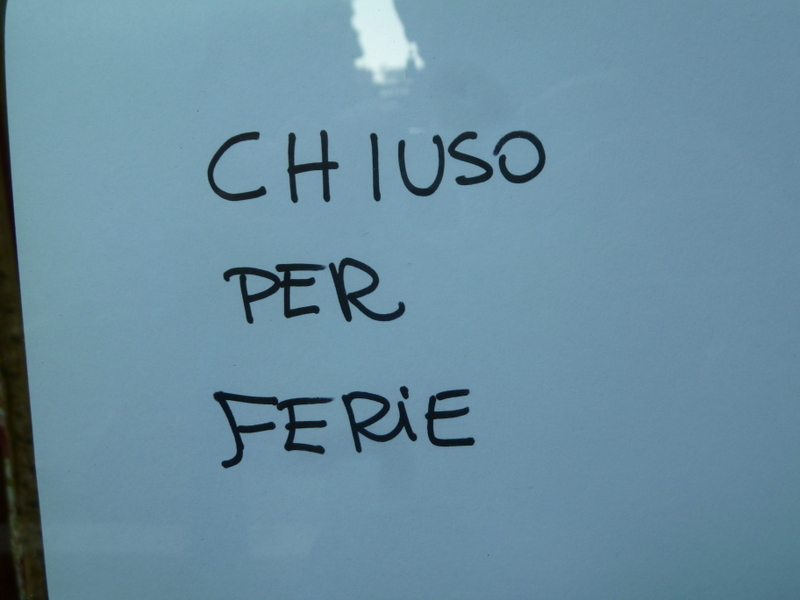 Another tradition of ferragosto is to give your portiere (building superintendent-manager-doorman-handyman all rolled into one) a gift of €25-€50 (about $33-67) in recognition of what they do for us. This is also traditional at Christmas and Easter. The portiere is also key to security, so he remains on duty in August when many apartments are vacant and is – hopefully – a deterrent to the break-ins that increase in frequency during the mass-exodus to the beach. 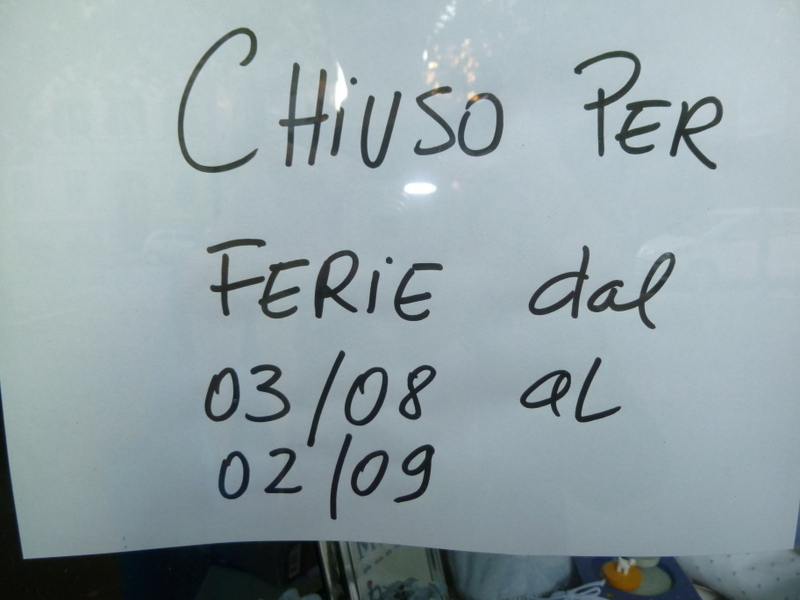 This children’s shop in a posh neighborhood is closed from 8 Aug to 2 Sept.
Today, August 15, is the actual ferragosto. The Embassy is closed, as are most businesses not in the tourist-trade. Our neighborhood is Christmas-morning quiet. No dogs, no birds, no motorini, no traffic, just one suspicious helicopter circling occasionally (never a good thing). We were able to find a nice bar (cafe) open for a holiday cornetto e cappucino fix. While it may not be the best economic decision to close your business during the current crisis, I have to respect the tradition. People spending time with their families, having lunch with grandma, and escaping the heat if possible. For an amusing look at the holiday, seek out the movie “Mid-August Lunch” (Italian with English subtitles, available to stream on Netflix). Yes! The Ides! Today is *il ponte* “the bridge” to the weekend, and no Italian that can possibly avoid it is working today. I rode a bus to work totally alone – the poor man’s limousine!